Symphony, No. 36 C major, KV 425 'Linz Symphony' composed by Wolfgang Amadeus Mozart (1756-1791). Edited by Friedrich Schnapp. For orchestra. This edition: Stapled, Urtext edition. Stapled. Barenreiter Study scores. Study score. Language: German/English. No. 36. 60 pages. Duration 29 minutes. 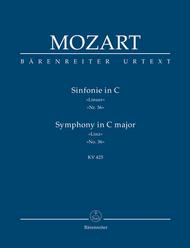 Published by Baerenreiter Verlag (BA.TP16).ISBN 9790006200146. With Language: German/English. 22.5 x 16.5 cm inches.